It's DOUBLE the fun! This unit feaures a double slide. Customize the 4 in 1 Dual Lane Combo with pool to fit any theme. The modular front allows you to select a banner and theme it to your liking. Don’t forget to check out our banner section! We have a ton of banners that you can add at NO EXTRA CHARGE. Simply click HERE . The journey begins at the inflated ramp that leads into the bounce house opening. The children enter the bouncing area and are surrounded by colorful netting. The netting provides plenty of fresh cool air on a sunny day and provide visibility to ensure safety. The ladder that leads to slide offers straps in between each step to aid little hands while climbing. As you reach the top of the slide .... you can rest assured. 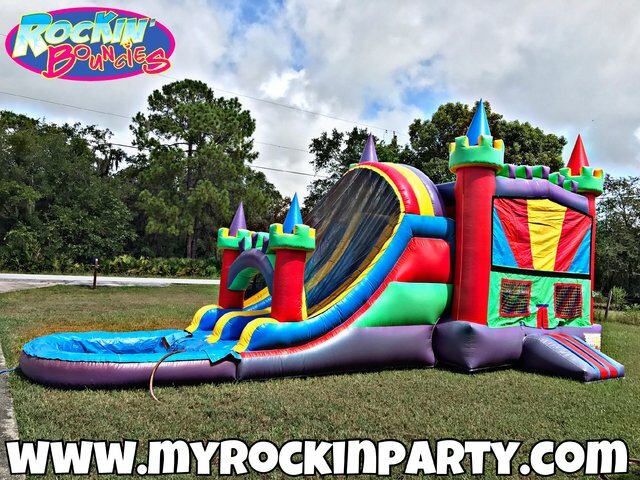 The whole slide is encased in protective netting to keep all your party guests (big or small) completely safe while they land safely on the bottom of slide. We place a pulsating sprinkler head on the top of the slide to mimic a waterfall effect. The water flows all the way to the bottom of the pool. A splashin’ 2 feet of cool refreshing water awaits your eager party goers. Endless hours of coolentertainment awaits. Don’t forget to add a soft air fillled ball to begin that game of Air Basketball.